Unfortunately, due to a few changes in my day-to-day life recently I am going to have to put this blog on a bit of a hiatus. 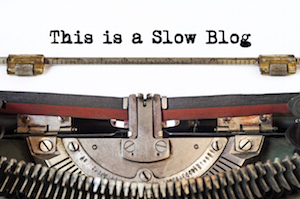 It doesn’t mean I am stopping this blog, it just means that entries will be even slower than usual. For more regular updates you can visit my twitter feed (I am finally getting the hang of it), I have added an update bar at the side of this blog that you can see (or click on the link under “social profiles” to follow me on twitter). In my twitter feed I talk about everything that interests me from the Slow Movement, to NLP, to philosophy, to random thoughts and ideas. As you can probably see, if you are regular visitor here, that I have made a few changes around here (partly to reflect my current situation and partly to update it to my changing attitudes towards the slow philosophy). I am updating these pages as and when I can and should get it done in a week or two. This 48 minute audio and 44-page ebook (an edited transcript of the audiobook) covers everything you need to know about the Slow Movement, slowing down, the idler and as well as exercises, tips and techniques to help you slow down right away. In this audio programme you will be taken through a simple exercise that will help you deeply relax and remove all that tension and stress from your body and mind and allow you take on life with an increased sense of wellbeing, confidence and vitality. This 32-page ebook gives you ten simple tips to start slowing down, including breathing and postural exercise, a portrait of an idler and an Idlers Journal. This talk was recorded LIVE at the Vision For Living Festival in Cardiff on the 31st October 2009. I am still seeing people for one to one coaching in how to slow down, mindfulness, etc. But my time is now a bit more limited. If you are interested in coaching, either face-to-face on by Skype please click on the coaching tab. Well, as Lau Tzu once said “May you live in interesting times. Or die of boredom“, I am certainly living in interesting times at the moment! I will be back with more updates as often as I can.